What can CUFA Lending Analytics do for you? 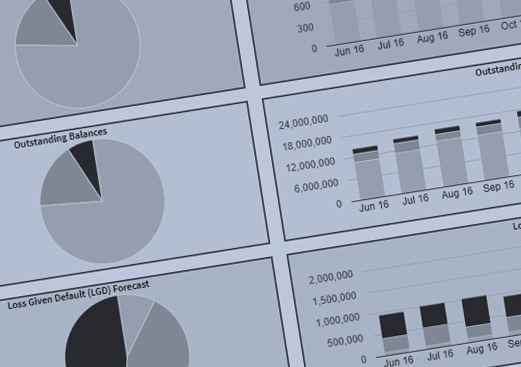 Our multi-layered reporting system gives you on-demand insights into your loan portfolio. 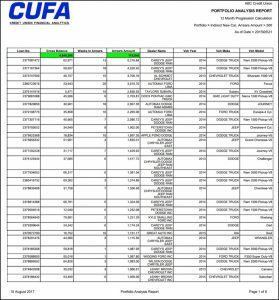 As soon as your historical loan data has been loaded into the system, CUFA Lending Analytics (CLA) will immediately begin giving you insights into your consumer loan portfolios like you have never seen before. You do so through a browser-based interface that gives you secure, highly interactive access to CLA outputs from any PC or other Internet-enabled device. The interface takes you to a variety of dashboards and data analytics screens that report, from multiple perspectives, the performance and credit quality of each of your portfolios. You can instantly export, as either Excel or fully formatted PDF files, both standard reports and a virtually unlimited range of ad hoc reports defined by the parameters you select. By drilling down through each portfolio you can instantly calculate expected loss forecasts, both for the total portfolio as well as for sub-portfolios you can define ‘on the fly’ using any of the data field variables you have provided to CUFA. Hence, you can easily analyze credit quality for any group of loans you specify based on, for example, the purpose and/or term of an installment loan, the dealer who originated a car loan, the loan officer who approved it, the value of the collateral securing the loan, the borrower’s credit score, the branch where the loan was made, or by using any combination of the above and any other characteristics of the loan included in the data files you supplied to CUFA. Other analytics screens show you the degree to which each loan ‘bucket’ carries expected losses greater or less than the average for the whole portfolio, how that risk has trended over time, and perhaps most importantly the ‘risk premium’ you need to charge for each loan type and term to cover its expected losses. As a result, CLA enables you to make product design and pricing decisions based on robust data that reflects the actual performance of specific loan types made to the particular group of borrowers you serve. For example, CLA will show you which car dealers are sending you good loans and which are sending loans likely to go bad — and the additional rate of interest you need to charge to cover that risk depending on the term of the loan. The resulting outputs from your ad hoc queries on every screen, with the specific data fields you pick for sorting and display, can be immediately exported to an Excel file or a fully formatted PDF report that document the data filters you used to define your query. 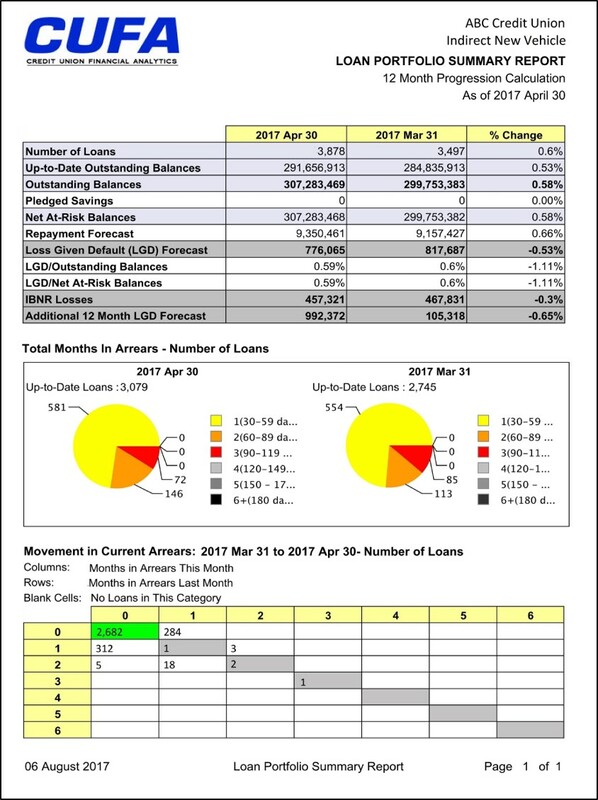 The credit control analytics screen charts the arrears progression for each portfolio over the period (and defined by the metrics) you choose to identify the delinquent loans that are priorities for immediate collection efforts. On that screen and most of the others, clicking on an individual loan will drop down the detailed history of the loan over the period loaded onto the system. 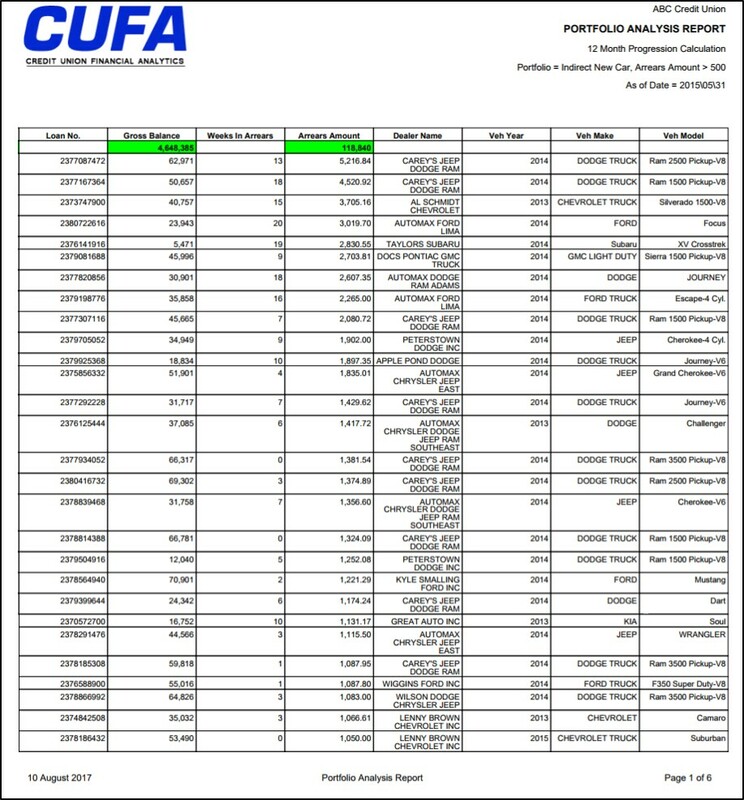 At each level or category in your portfolio, CUFA Lending Analytics gives you an instant calculation of the expected losses from that set of loans and the starting-point loss provision (allowance for loan losses) we recommend, based on our proven algorithms for determining safe provisioning levels. CLA instantly calculates the starting point provisioning (ALL) amounts required by auditors and regulators under the ‘expected credit loss’ standards mandated by the new international accounting standards (IFRS 9, CECL, and FRS 102). For compliance with those standards, the software also enables users to quickly define and document any groups of individually significant loans that require manual review for provisioning purposes. This capability is an important reason why leading accounting firms are recommending CLA to their credit union clients. That’s because CUFA automation eliminates labor intensive and expensive manual work that both credit unions and their auditors would rather not do. Provides you as a director the means to objectively monitor and measure the CEO’s performance in managing the risks and opportunities of your lending business. Supplies the key lending metrics you and your fellow directors need for effective board oversight of the single most significant source of income (and risk) for your credit union. 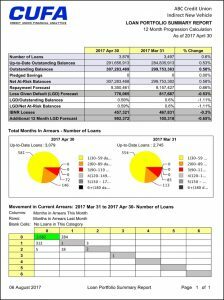 Provides the facts to inform your understanding of the actual credit risks in each of your credit union’s loan portfolios, on a monthly updated basis. Gives your board high-level oversight of the effectiveness of your collections and credit control function. Supplies the fact-based data you need for the board’s periodic reviews of lending, credit control, and other risk management policies by objectively measuring how well they are working. CUFA Lending Analytics gives you as a director the confidence of having a completely independent and objective means to monitor lending risk and how well the CEO understands and is handling it. It is a key tool to foster and maintain an appropriate governance process in which the board focuses on strategic direction, policy and monitoring results, and the CEO manages the credit union. CUFA Lending Analytics is a key tool for meeting your legal obligations for risk management, internal audit and compliance. Gives you in-depth insight into your loan portfolios that demonstrates to your board, auditors and regulator that you are on top of your game of managing your credit union’s lending. Gives you the critical lending risk numbers you need for board and regulatory reporting. 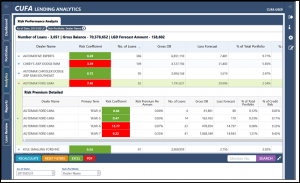 Enables you to identify risk trends in credit quality. Highlights strengths and weaknesses in your credit control policies and practices. Tracks recovery rates on bad loans. Identifies your best and worst performing loan products. Gives you the insights you need to improve and price existing lending products and to design new ones. Gives you the insights you need to grow your lending portfolio. Objectively measures staff/branch performance in making loans that get repaid. Objectively computes the data needed for safe and accurate loan provisioning. Shows how well your underwriting practices are actually working to manage risk. Displays how well loans are performing by size, by type, by collateral, whether or not rescheduled, etc. – using the parameters you select. Calculates how well top-ups and other multiple loans to the same borrowers are performing. Helps you identify which loan types need more/less/different underwriting attention than you and your team are giving them. Allows you to easily drill down into the record of any borrower to see his/her payment and arrears history before you grant a new loan advance. Gives you the data to realistically know when loan restructuring is actually likely to result in repayment. Shows you which loan officers are generating good loans – and bad ones. Supplies the data you need for management reporting to the CEO. Gives you a clear read on whether the arrears situation is improving or deteriorating and where. Spots the early arrears your team should address before they get worse. Tells you which loans are most likely to be collected and where you should focus your efforts. Measures the effectiveness of your collection activities. Shows how well your outside collection agencies are performing in reducing your losses and increasing your recoveries. Helps you identify which of your team’s practices are working and where your team can improve collections and reduce write-offs. Quickly and objectively determines the starting point for a safe level of compliant loan provisioning. Identifies those loans that should be reviewed individually and in detail for provisioning purposes. Supplies the key lending risk numbers you need for management, board and regulatory reporting. 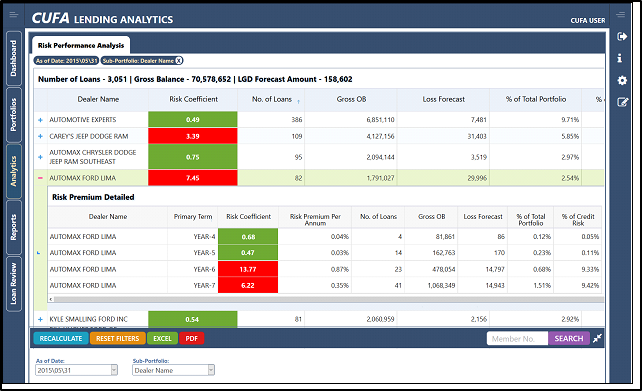 Identifies risk trends in loan pricing and underwriting. Spots risk anomalies and potential policy breaches that should be investigated. Speeds up your periodic loan reviews by focusing your attention where it is really needed on problem areas, large exposures and other outliers. Simplifies the annual audit and potentially reduces its cost. Provides robust valuations of a loan book based on an objective, in-depth examination of its current state and expected future performance. Facilitates exchange of experience between credit unions considering a merger to ensure that their operational and cultural differences around lending can be identified and accommodated. Helps set goals and expectations for both teams in advance of the merger based on objective measurements of current lending performance benchmarks in both organizations. Gives you a key tool for making more loans that are good loans and that build net income for your credit union.